Whitey Herzog and Tony La Russa both ended their Hall of Fame managing careers as Cardinals. Both decided to extend their baseball careers as executives with other teams. Herzog’s effort largely was a bust. On May 17, 2014, La Russa was named chief baseball officer of the Diamondbacks. In this newly created position, La Russa, who reported to club president Derrick Hall, oversaw the entire baseball operation, according to published reports. In October 2016, La Russa lost control of the baseball operation after failing to get the Diamondbacks into the postseason and was demoted to the role of advisor. A year later, November 2017, La Russa became special advisor to Red Sox president of baseball operations Dave Dombrowski. La Russa joined the Diamondbacks three years after his last season as Cardinals manager. He had led the Cardinals to three National League pennants and two World Series titles, retiring after winning the second crown in 2011. Herzog joined the Angels one year after his last season as Cardinals manager. He had led the Cardinals to three National League pennants and one World Series title, quitting in midseason with the team mired in last place in July 1990. In September 1991, Herzog was named senior vice president and director of player personnel of the Angels. Herzog believed he, like La Russa with the Diamondbacks, was overseeing the entire Angels baseball operation. Instead, he found himself in a power struggle. Dan O’Brien was the Angels’ senior vice president for baseball operations when Herzog was hired. Herzog thought O’Brien primarily would be his assistant, handling paperwork. O’Brien thought Herzog primarily would be evaluating players, leaving O’Brien to direct most of the baseball operations, including approval of trades and free-agent signings. Herzog won the battle _ O’Brien eventually was fired _ but lost the war, resigning before the Angels could become contenders. His friends, Angels owners Gene and Jackie Autry, hired Herzog with the goal of bringing the franchise its first American League pennant and World Series title. Herzog was given an apartment in Anaheim, but kept his residence in the St. Louis area and did most of his work from that home. He didn’t have an office at the Angels ballpark. O’Brien did have an office at the Angels ballpark. In 1992, Herzog’s first full season with the team, the Angels finished 72-90 and ranked last in the American League in hitting and runs scored. In mid-September 1993, Brown convinced the Autrys to fire O’Brien. Bill Bavasi, the Angels’ farm director, was promoted to general manager, reporting to Herzog. Bavasi was to handle administrative duties. Herzog was given the title of vice president in charge of baseball operations and was allowed to continue to work primarily from his suburban St. Louis home. Herzog’s old-school tactics backfired with some players or their agents. He also may have felt restricted by a reduced player payroll. 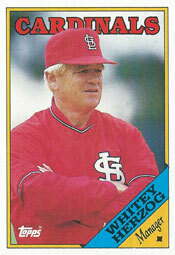 In January 1994, four months after O’Brien was fired, Herzog resigned, stunning the Angels. Bavasi replaced him. “He had a great deal of respect and recognition among his peers, but the reality now is that this is a different era, and he hasn’t crossed that bridge,” said Steve Comte, Frey’s agent. In his book, Herzog took credit for identifying Angels minor leaguers Garret Anderson, Tim Salmon, Jim Edmonds and Gary DiSarcina as prospects and for preparing them to advance to the majors.